As I recall, it wasn't 'chinese cheap' but it works very well and we use it more than we thought we would. Yes I have one of those tucked away in a drawer. Extremely useful. Only irritation is that it's calibration period is obviously written into the firmware so it nags me to send it off whenever I use it! but the rotary 4 pole 9 way switches I've found so far are several times more than the cost of the kit ! I wonder how well this kind of rotary switches would work? Are there any reasonable quality rotary switches like used on scope voltage input stage? Probably someone has considered building simple specialized input amplifiers, bit like differential amplifiers or such. Really hard to build an amplifier that is good in everything, but not too hard to build amplifier that does one or two things good eneough. Those "Wafers" are not silly money, but shaft and rest of it will add up. But they are higher voltage and probably lower capasitance etc. What about post weld heat treatment? Have you got a heat blanket to wrap the board in for stress relieving.....?? I was planning on peening the welds to relieve the stress John . And some tackle to practice with . yea, they are a bit titchy, on that board the 0603 resistor is the smallest and that is what is on the scope kit, the frightening thing is,they come even smaller than that, at least three sizes. funny coincidence, I just ordered an 858D hot air gun, different make to yours tho. got it off Fleabay. If you are interested in a review see here. A different make again but the same thing. make sure the chipping hammer is sharp before you start. Cheers for the youtube link very interesting they all look very generic , my one feels and look canny , not bad for the money , mains lead is a tad short . 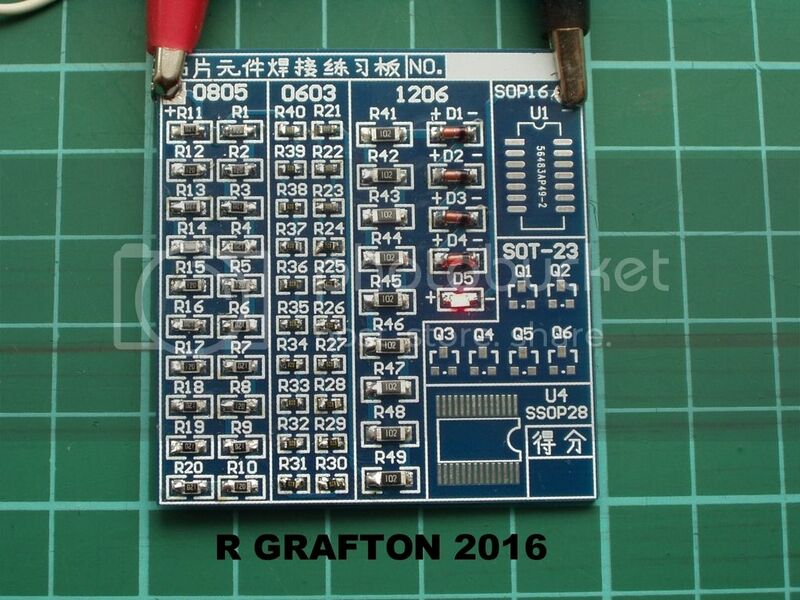 I thought you'd like that, he has an SMD solder tutorial here. as far as I can see they all look the same. Question , How long were you on soldering all those resistors ? Rob, I think it took me about 15 mins per column. put 3 volts across the led an see which way it lights.......................only 3volts tho or........ once its all done you can put 9 volts from pad to pad. if you hold the board up to the light you can see the trace. that guy has some very interesting videos. I have given up on mine now, i had the No trace on screen. I bought another screen kit and it is just the same...no trace but all other stuff is ok..just those two voltages that are not correct so binned it i went to the forum and one other person has asked the Q' with the same symptoms, and no answer from the mod or users, so bin it was. Rob. I received my hot air station this morning. you said your mains lead was short, how short is short? mine is a separate one that plugs in the back and it's 5 foot long. It works well tho, I tried desoldering a tiny 16 pin IC and it came straight off the board. Hi John, this is the one I got. I ordered it on Tuesday and it arrived this morning. Boy, I'm kicking myself that I hadn't bought shares in this company when it was first brought to light. I've lost count how many kits have reportedly been bought as a result! I got one scope kit yesterday. I was just eyeballing the PCB. Should have a cunning plan for the external rigger signal, but I want to assemble it as "standard" now. Display comes over it, not too much space for connectors or standoffs. There seems to be some "optional" connectors: Like Mini USB and some for programming. Anyone used them? We never heard how you got on with those SMD components. You must have finished by now. I have had a wee practice using the hot air gun and solder paste with mixed results , looking for a way to apply just the correct amount of paste . You've got one upside down! all the pixies will fall out. Nice looking drill press, is it a recon job or just chuck it in a space and use it? posh microscope you have there, all I've got is a MK1 eyeball and a magnifying glass. So opinions please on the hot air rework unit ? Are they good, rubbish or something else?